Autocuehire can help if you’re planning a TV shoot. 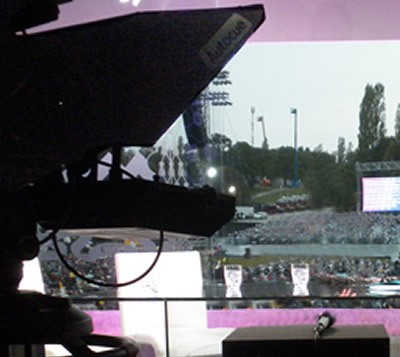 At Autocuehire we are a specialist autocue and teleprompter hire company with decades of experience in both live and pre recorded television shows, delivering a seamless service from that initial phone call, to the director calling ‘wrap’. Using an autocue teleprompter means your presenter will deliver the script accurately, first time, every time. It helps them do their job well, and importantly reduces the need for multiple takes, saving time in the edit. Our autocue systems fit directly onto your camera using robust brackets. They can also be mounted independently off camera on our own tripods (which we provide as standard). This method is useful for interviews or when actors need to speak to each other with a little help. We have a variety of autocue sizes to suit any set up. We can mount onto jibs, peds, cranes and tracks. Cue lights and batteries can also be provided depending on your requirements. A robust application designed for professional productions. The software runs on the Windows platform and easily imports word documents. Any changes can quickly and easily be made on site. It allows Runorder management for multiple scripts and supports all unicode languages. The state of the art equipment we bring on site compliments the skill set of our professional operators. We deliver the kit to your location. Our operator sets everything up, inputs your script and runs the autocue from start to end. Our operator is happy to make any changes to the script you need and rehearse as many times as needed to make it perfect. After you wrap the operator will pack everything up and take the kit off site, you can even have a copy of the final script for editing!